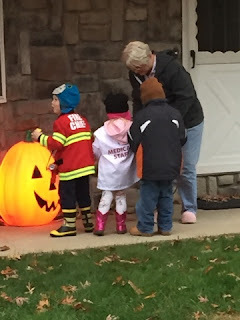 The Hayes Homestead: Halloween Recap! 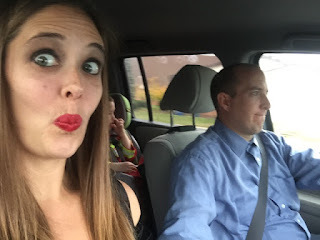 I wanted to do a quick Halloween recap from all the fun festivities we had this year! 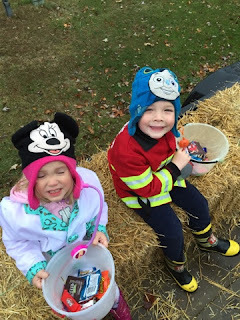 The kids (Redmond especially) were really into it this year. 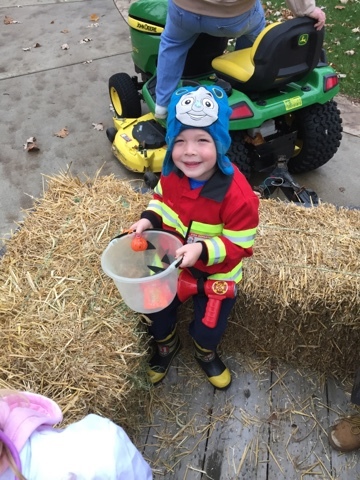 Redmond has known since last Halloween that he wanted to be a fireman. Surprisingly, he held to that and that's exactly what he was. Ashlyn was going to be Elsa - she got a pretty Elsa dress from her friend Eliza for her birthday and I couldn't wait to braid her hair. It's long and blonde - perfect for an Elsa braid! 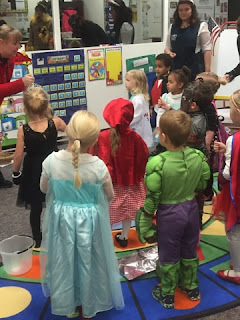 We kicked the Halloween festivities off at Redmond's school on Thursday. He gets to trick or treat through his school and lucky Ashlyn gets to tag along. But, she woke up Thursday morning and did not want anything to do with going trick or treating. "I'm scared of the ghostes!" she said. 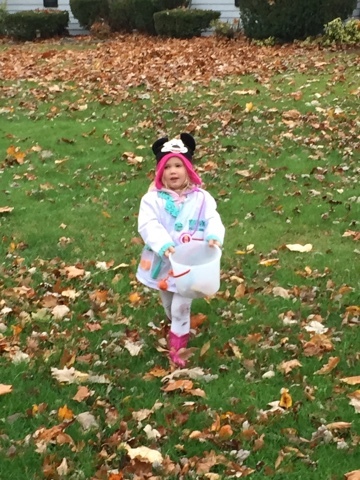 I calmly told her that we were going and that she needed to get her costume on. 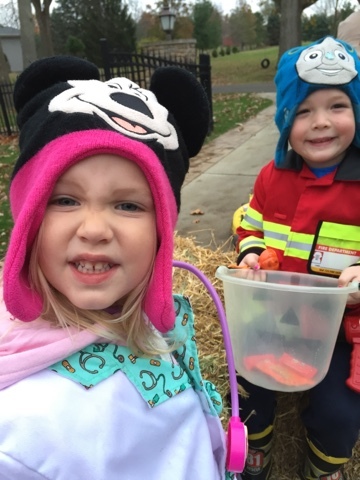 "I'm not Elsa. I'm a doctor!" Ok, girl.....you win. 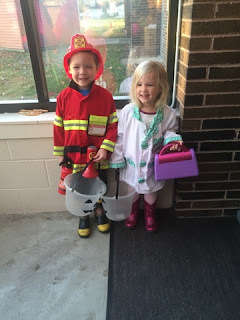 We had a dress up doctor coat and she had a Doc McStuffins bag she had gotten for her birthday. 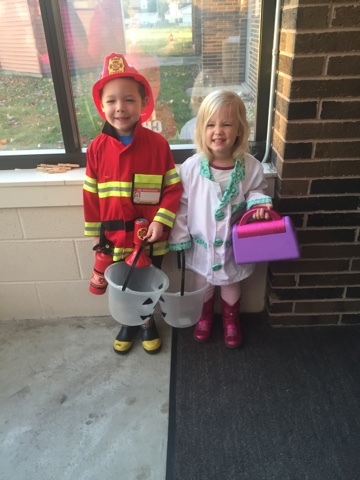 They were both downright adorable....if I do say so myself. 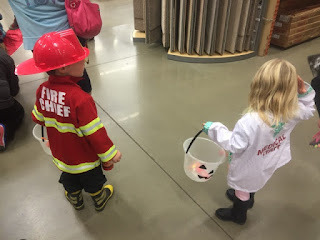 Thursday evening we headed to our local Home Depot where they had a path set up through the store for trick or treating. 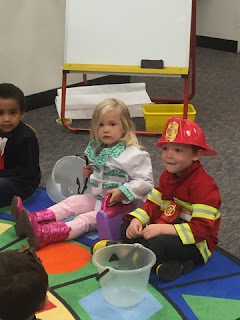 It was slow moving, but the kids enjoyed it! Friday night my girl Marie and her family hosted a small Halloween get together. I borrowed a costume from my mom (not even really sure what I was - maybe like a female vampire? It was a good excuse to go super heavy on the makeup!) and Jason was Carl from the movie Slingblade. Y'all, he had that character nailed. It's almost frightening how much he could sound and act like Carl. The party was a lot of fun with great company. Marie had a table set up for the kids to decorate cookies - they were all about that! And, the kids were able to make this cool ghost craft with glue and marshmallows. 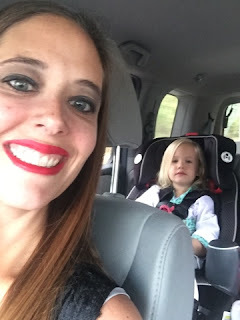 We had a great time and left with full bellies!! Saturday (Halloween) was dreary and rainy :( But, that wasn't going to stop the kids from trick or treating! Well, Ashlyn was hesitant yet again, but she quickly warmed up to the idea and had a lot of fun. 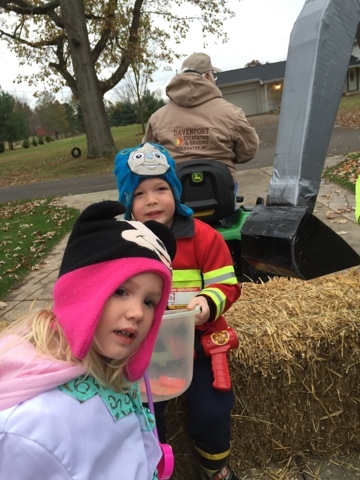 Our neighbor does a hay ride every year for trick or treating and that is a pretty big deal when you're 4 and 3. 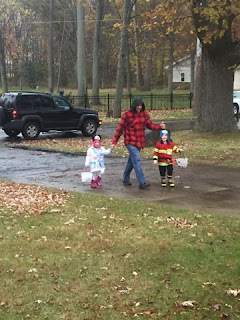 Jason was the trooper and took the kids while I stayed back to hand out candy. It was a great three days filled with Halloween excitement. Next year will only be better!